Succesvol gefinancierd via Symbid crowdfunding! What if you could invest in a solar energy collector that delivers 4 times more energy than any conventional PV panel? It is possible! The International Energy Agency (IEA) stated in their 2012 Solar Heating & Cooling Roadmap that PV-T technology (producing heat and electricity from one surface) is the most efficient way to capture energy from the sun and to solve rooftop competition. We fully agree! That’s why Solarus developed its PowerCollector™ with a concentrated PV-T technology that produces a high yield of heat and electricity. TÜV Arizona measured a record efficiency of 70%! Conventional PV-panels score only some 20% (Link). Year round our PowerCollectors deliver up to 4 times more energy than conventional PV-systems. Our achievement is widely recognized by the market: we contracted >30 projects (1.000 collectors) in 15 countries, in October 2016 we won the Accenture Innovation Award and recently two professional early stage investors committed, after an extensive due diligence, each EUR 2 million investments for the scale up of the business. This is adding up to EUR 8,4 million investments of earlier investors and a recent Eureka Eurostars grant of EUR 2,68 million (EUR 1,2 million direct for Solarus). We are on a mission. We market our solution to the world, fighting energy poverty and drastically reducing CO2 emissions. Business scale up is leveraged through a fast growing international network of distribution and assembly partners. This power helps us to make impact: one roof at a time and we are aiming for 400.000 PowerCollectors™ over the next three years. The world is in the middle of an accelerating energy transition from fossil to sustainable energy sources. The demand for sustainable energy is booming. Every year 50% of all the energy consumed in the world goes to the production of heat. That’s why the PowerCollector™ captures directly the heat from the sun (55%). And on top of that comes a bonus of electricity (15%). In situations with a need for heat and electricity the PowerCollector™ is the best choice for sustainable energy. We now offer you a unique opportunity to join an actual investment round of EUR 6 million for solar power champion Solarus. The company has a stable product, international market presence and high volume production facilities. We project a steep growth towards an intended IPO. It’s the ideal moment to ask the crowd to step in and have more ambassadors. We are asking the crowd to fund an amount of at least EUR 250.000 with the ambition to exceed this. You are kindly invited to be part of our growth! Key in our business model are our local business partners in each geography. When we enter a country we select one or more distributors (mostly larger installers) ready to develop the market with us. When there is enough market potential we work towards setting up one or more assembly factories in the specific geography. Working with local business partners (distribution and assembly) is the multiplying factor in our business model. This is the real power that allows us scaling up very fast in the coming decade. In 2006 Solarus started in Sweden as a spin off of a thermal research team of Vattenfall. At that time the company focussed on producing heat collectors for the local Scandinavian market. Early 2009 the first concept of a Concentrated Hybrid PV-model was produced. That was the start of an intensive R&D track. 2011 Technology/Science ‘think-tank’ ZERI (Zero Emission & Research Initiatives) www.zeri.org elected Solarus #53 disruptive sustainable technology. 2012 TÜV Arizona (USA) Proof of Concept testing and measuring 70% efficiency. 2014 Start build up of strong patent portfolio of concept and applied technologies. 2016 Automated factory (2015/16) in Venlo producing the PowerCollectors™. 2016 Commitment of EUR 4 million venture capital (NASA/Catena en OPEN to invest). Solarus is entering its scale up phase. The PowerCollector™ is a stable and well tested product. And with the admission in September 2016 of an Eureka grant of EUR 2,68 million (EUR 1,2 million directly for Solarus) the future product development is guaranteed. We now have a financing round of EUR 6 million. Already EUR 4 million is committed by two professional early stage investors and another EUR 440,000 is invested by senior management and existing shareholders. With the crowd funding we are aiming to raise at least EUR 250,000 (or more). In the meanwhile we have continuous talks with parties that are lining up to join in the actual or the next financing round that we expect in second half of 2017. Most probably we start preparing for an IPO by the end of 2017. Recently two professional investors -NASA/Catena (NL) and OPEN (UK)- committed each EUR 2 million investments. And in September a EUR 2,68 million (EUR 1,2 million for Solarus) grant that was assigned by the Eureka-Eurostar program for further development of Solarus innovative technologies. With this substance we feel very confident to ask the public crowd to join in the fast scale up of the company. With a crowd funding in shares aiming at at least EUR 250.000 investment, representing a 1,7% in shares in Solarus Sunpower Holding bv, the company can further boost its activities for the upcoming year with a projected revenue for 2017 of EUR 15 million. For 2018 we are projecting revenues exceeding EUR 70 million. With the involvement of the crowd –money and word of mouth- Solarus gets more backing in achieving its mission to fight energy poverty and the emission of CO2. For 2017/2018 an IPO (listing) at the London Social Stock Exchange is planned. Offering a possible exit for early stage investors. The executive summary from the investment report off Open can be found here. You can request the full report at the Solarus office. 30 years’ entrepreneurial experience, 20 High-Tech start-ups in addition to leading several national and international corporations in ICT (US, Europe, NL). Mr. Zevenbergen is the co-founder BCorp Europe and author of several successful management books: Rip off your neck tie and dance (Dutch: En nu laat ik mijn baard staan), which sold over 100,000 copies. 25 years’ experience as international entrepreneur, specialized in technology start-ups; was partner in a leading business consultancy (Boer & Croon). 20 years experience in international high-tech corporate environment in finance & accounting. 30 year experience in international marketing, brand building and communications (Origin, EuroRSCG). Entrepreneur and investor in several communication/tech start ups. Extensive experience in solar research both in Swedish and Portuguese universities as well as with CERN, Geneva. 20 years background in sustainable energy, international business development. Worked for a multinational, a leading sustainable energy company (Eneco) and TNO the Dutch centre for applied research. Why is the PowerCollector™ a top performer? The Solarus PowerCollector™ is a concentrating, hybrid solar panel that produces both heat and electricity at the same time. Concentration of sunlight is achieved with a curved mirror to collect more of the available sunlight throughout the day. This sunlight and the heat it produces are collected with a very smart aluminium panel that is sandwiched between photovoltaic cells. It captures and transports the heat and cools the cells at the same time. Active Cell Cooling (ACC) is part of the secret behind the superlative performance. PV cells do not like heat; for every 10°C they heat up, their electrical output goes down by 5%. Our ACC-technology counters that negative effect ensuring that the PV cells on Solarus PowerCollectors™ show a steady performance. The PowerCollector™ has the highest-ever yield measured*) for a solar panel. One PowerCollector™ (2.14 m²) sells at a price of between EUR 600 and EUR 650 depending on project size and geography. Its peak performance is 1.250 W(thermal) and 250W(electricity). The PowerCollector™ has some strong patents for innovations in the concept, the concentrator and the high-performance silicon gel that protects the PV-cells. The product is very robust and accurate as it combines Swedish and Dutch industrial design. Key in our business model are our local business partners in each geography. Here is where the multiply factor comes in. When we enter a country we select one or more distributors (mostly larger installers) that are ready to develop the market with us. When there is enough market potential we work towards setting up one or more assembly factories in the specific geography. Our personal networks help us in finding the right business partners and get the right introductions to them. So far we did so in Turkey, Spain, South-Africa, Switzerland and Italy. Working with local business partners (distribution and assembly) is the multiplying factor in our business model. This is the real power that allows to scale up very fast in the coming decade. Now that we are scaling up our production facilities with a fully automated production line, we will be working towards economies of scale. This means that over the next years we will be able to produce with good margins to finance our continuous growth and make a profit as well. The license fee model that we will roll out with our assembly partners will also secure a future stream of income. And for the future we can also decide to license out some of our patents. The PowerCollector is completely designed for mass production. Our production line is equipped with specific tools to run a high volume production of > 30.000 PowerCollectors™ year). We can easily ramp up production in our factory in Venlo by copying the existing production line. When we open a new assembly line we can add at least 20.000 units to our annual production capacity. By mid 2016 the design for the PowerCollector™ was ready to be moved into production. Today it is a stable and fully tested product that is being installed on in all our current new projects. For all recent installations we have an online monitoring system that enables us to read out the performance of each system and give directions to our customers. With our team we are working on further innovations that can be easily integrated in and add value to the PowerCollector™ such as an ‘in roof’ PowerCollector™ that can serve as a roof-cover. This can be applied in designs for new buildings or renovation of existing structures. The ‘in roof’ version will solve often complex mounting issues. We expect to start production of the ‘in roof’ system in first half year of 2017. We operate in a super fast growing global market for sustainable energy. For this moment we focus on a few geographies and a few vertical B2B sectors. Over the last few years we delivered our systems in flagship projects directly to end customers (business and private persons). As we now have established more and more business partnerships with local partners we will start selling indirectly to the market and leave the sales and installation to our partners. We are a very attractive alternative for conventional PV-panels and for solar heat collectors as well. Even if we are able to supply 1% of the sustainable energy needs in our actual target countries we will have to produce ten or more million of PowerCollectors™ over the coming decade. With a market prize of around EUR 650 per collector and an average of EUR 350 installation materials this means a revenue stream of EUR 1 billion for every million PowerCollectors that we will produce. Our company has a global scope. The market size is beyond the horizon. The IEA (International Energy Agency) in Paris projects in its 2015 Bridge Scenario annual growth of solar energy market of almost 10%. In 2030 5% of the world's energy consumption of 643.469 PJ (PetaJoule) will be delivered by solar sources. Especially for urban areas IEA says PVT is the way to go. The battle for the rooftops will be there soon. The global PV market showed an annual growth of 42% between 2000 and 2015. The total cumulative installations amounted to 242 GWP and an installation in 2015 of around 1 billion PV-panels. The current PV market exceeds EUR 84,5 billion. By 2020 this market will be doubled or even tripled. Solarus aims to take a part of this volume. In the field of PVT solar collectors there is a limited number of mostly small and local companies active. We have analyzed their technologies. No one uses the concentration technique we use, and the technological concepts differ quit a bit. Some of these market parties are still in POC (Proof of Concept) -phase and can't yet deliver. Names are: Fototherm, Solimpeks, Dualsun. We measured performance of competing systems and we came out best (in most cases by far) in year-round performance. Reactions from our partner in Switzerland on a regional real estate exhibition SIL in Etoy: “The Solarus panel raised the interest of all real estate professionnals we met, as well as the HVAC specialists. The possibility to benefit from the best performances of a photovoltaïc panel together with those of a thermal panel, while using the surface of only one panel, seduced all our visitors. Projectmanager Sustainable Energy Dutch Municipality: “We will use the PowerCollectors for several flagship projects in our city to reduce CO2 and create awareness for combining heating and cooling”. For the establishment of new assembly lines in 2017 we are in negotiations with three different investors on three continents. These investors have an energy distribution or building construction background with strong local networks. The PowerCollector™ is the third generation solar technology with a major competitive advantage over the first (heat collection) and second(PV) generation. Every year 50% of all energy consumed goes to the production of heat. Most of that energy is non-renewable. According to the International Energy Agency (IEA) the PV-T technology is the most promising way to capture the energy of the sun. This is reflected by the highest yield (70%!) ever measured by TUV of the Solarus PVT technology. The yield of a normal PV panel equals 20%. PV-T is heat and electricity on the same square meters; hereby delivering up to 4 times more energy as conventional PV. According to the IEA there will be a battle for roof space worldwide in the very near future. By combining heat and electricity on the same square meters, and providing an easy to install system, Solarus has the best position to win this battle! Another big advantage is that the price per Wp installed is significantly lower than PV, up to 50% depending on the location. Solarus is the first company in the world that has succeeded in developing and producing this PV-T technology in mass scale. 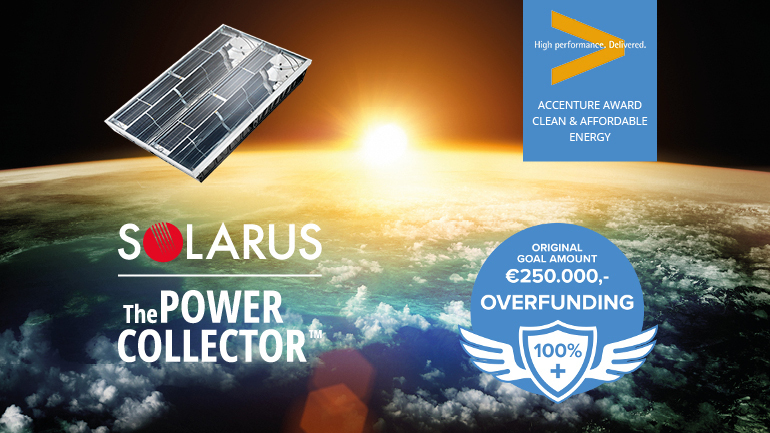 Solarus brings this revolutionary and highly disruptive product to the market as the PowerCollector™. With this next generation solar product it becomes possible to solve energy poverty and to massively lower CO2. Solarus brings Sunpower to the People. In 2015/2016 we sold 1.000 PowerCollectors™. For 2017 2.500 PowerCollectors™ are contracted and >85.000 PowerCollectors™ are offered in proposals. At this moment we do direct sales in Western Europe (out of the HQ in Venlo) and through our sales office in South-Africa (CapeTown). In the future direct sales will only be done to large global customers. But even there we prefer to work with our local partners to service the customers. In several European countries (Spain, Italy, Germany, UK, Ireland, Switzerland, Turkey, Netherlands, Scandinavia), South-Africa and India we have established/are establishing distribution partnerships. We are starting marketing campaigns for specific sectors (e.g. hotel business). We have experienced good results with campaigning on social media and we will continue to do so. And we are planning a general awareness campaign directed at the opinion leaders and pioneers in the sustainable energy programs and implementation (policy makers, NGO’s, architects, city councils, sustainability/CSR managers, real estate developers). on short term: the aim is to have Solarus recognized as a very attractive alternative for sustainable energy in the three focus sectors (hospitality, (process)industry and domestic/real estate). We have a working partnership with five partners, all in the process of formalization and communication. Through SHV energy, a Netherlands based multinational supplier of energy solutions, we have partnerships in Turkey and Spain, and with SHV we are working on a similar approach in India and France; we are finalizing a partnership agreement in Italy and we are finalizing two partnerships in South Africa (large installer en and a large nation wide building market/building company). And in Switzerland we are near to completion of a partnership with an (intern)national architects/engineering firm. With all partners we plan to set up sales, marketing and in most cases, assembly lines. Solarus turnover so far is the result of sales related to the installation of ‘flag ship’ projects. Until mid 2016 the main focus of the company has been on R&D and the automation of the production process. Not on primarily on sales. In 2015 we produced a test series and sold this to several projects. In 2016 the full focus was on developing the automated production version of the PowerCollector and the set up of the automated production line. The actual financial numbers can be found here. Now that the new collector model and the automated production line is in place, we are well positioned and ready for exponentially growing our revenues. The business model assumes close cooperation with strong partners in the different countries. The partner will invest in an assembly line and be responsible for local sales and installations. We are in final stages of negotiation with partners and are targeting the sale of 3 assembly lines in 2017. This approach allows Solarus to exponentially grow sales in the coming years. The projected turnover comes out of the Strategic Financial Model prepared in close cooperation with Roland Berger strategy consultants. An assumption is that Solarus will sign with 10 strategic partners in different countries resulting in sales of 10 assembly lines during the time period 2017-2019. Project sales realised by the partners will drive component requirements of the Power Collector for the assembly lines in each of the respective countries. Another assumption is that Solarus will be able to execute its Cost of Goods Roadmap (CGR). The CGR assumes significant material (34% cost reduction) and labour hours (74% reduction) savings in future improved versions of the product over the next 3 years. The cost price reduction is an important driver to come to profitability. Since the spin off from Vattenfall in 2006, Solarus has attracted EUR 12 million investments mainly from some smaller public funds as well as from individual investors closely related to the company. There are a total of 85 investors. In the 2014 restructuring and the move to the Netherlands EUR 4 million of the investments was written of. In 2015, Solarus transferred from Sweden to the Netherlands and moved into the Venlo production facility. As part of the transfer Rabobank invested EUR 500.000 through its Kickstart fund and a local early stage investor put in another EUR 250.000. During 2015 and 2016 the current investors invested another EUR 1,8 million. There currently are 692.506 shares outstanding where the share price in the latest investment round was EUR 12 per share. This results in a pre money valuation of EUR 8.310.072. The shares to the crowd funders will be offered at the same share price of EUR 12 per share. After the closure of this investment round, there will be 1.119.673 shares outstanding. This results in a post-money valuation of EUR 14.396.072. By raising EUR 250,000 the crowd funders will own 20.833 shares at a share price of EUR 12 representing 1,7% of the total shares. The total investment requirement in this round is EUR 6 million of which EUR 4,44 million has already been secured. And we are close to secure another EUR 1,0 million before year end. Of the total investment an amount of EUR 250.000 (or more by overfunding) will be financed through the Symbid Crowdfunding campaign. In return of your investment you become shareholder of Solarus. With that, you also become part of a revolution in renewable energy and contribute in making the world a ‘greener’ place. Solarus is an ‘old’ start-up (and now scale-up) that has now come to a phase to deliver its full potential. To facilitate the upcoming growth, significant capital is needed and therefore we do not expect to pay our shareholders dividend in the near future. The current plans are very ambitious as you can see from the sales targets. And we are seriously looking into the opportunity to plan for an IPO (end 2017/2018). These plans might result in a valuation of EUR 100 million within 3-5 years from now. In that case, the expected return will be more then a factor 10 of the current invested amount. However, no guarantees can and will be made taken the amount of high uncertainty in the roll out of the business plan. Solarus has faced many challenges over the last years. We managed to come out stronger every time. Nevertheless we are still a start up, although very well equipped, that is now in its crucial scale up phase. 1. With the recent commitments of investors (EUR 4,5 million), some other investors close to make their investments and the proceeds of the crowd funding campaign we expect to raise at least EUR 6 million before Q1 2017 ends. This suffices to finance our development and cover operating expenses towards the next financing in second half of 2017 and from there towards the intended IPO. We now have EUR 4,5 committed.Of this amount EUR 1,5 has been paid to Solarus. EUR 2,0 million will be paid soon with no special conditions. EUR 1,0 million will be paid as soon as we reach the treshold of EUR 5 million. With the aim to raise at least EUR 500,000 with the fundraising and at least 6 parties now interested in investing in Solarsu EUR 1 million or more, we estimate the risk as 'low'. 2. We have invested a lot of time and funds into the set up of our automated production line. Our first production runs are very satisfying and we are ready to scale up fast. We also feel very confident now we are backed by the Eureka-Eurostars grant of EUR 2,68 million (EUR 1,2 million direct for Solarus) for a top team of engineers, scientists and operators that is focussed on the development of product and production technologies. 3. Now as we are getting more traction in the market we are actively approached by several parties in different countries to set up partnerships. Some of these include assembly partnerships right from the start. At this moment we are working on at least three assembly factories to be set up in 2017. As we already mentioned one of our recent investors, OPEN Opportunities in Envirotech from London (see www.opentoinvest.com ) did a thorough due diligence. The extensive full report contains too much competition sensitive information, therefore we share a summary with you in the background information. It is however possible to see the report on request at the offices of Solarus. For more info about the risks read the 'Business Risk attachment' via the following link.